Sumeet Vyas and Aahana Kumra can't wait to be back. Yes, Official Chukyagiri Season 2 is coming soon as Official CEOgiri. Ab Chukyagiri nahi CEOgiri hogi! “Drone”ņacharya CEO comes out of hiding and he’s going fully bonkers. He has two months to save his company. Will he, won't he? Episode 1 of Digene presents Official CEOgiri streams on Mar 19. 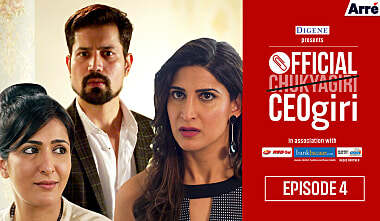 Binge watch Official CEOgiri, all five episodes back to back. RJ Salil & RJ Archana join Sumeet Vyas to prank RJ Karan at Radio City. "I don't think hum logon ko iss baat se farak padna chahiye ke log humare baare mein kya sochte hai. What’s more important is what we think about ourselves." Has Dilawar Rana finally saved Analog? Find out in the season finale of Official CEOgiri. Watch RJ Salil & RJ Archana join Sumeet Vyas to prank a colleague at Radio City.